Conducting a press inspection will help you facility run more smoothly. It is important to remember to check the commercial paper for thickness, texture, and the overall size of the document. Checking the paper will allow you to make any further corrections, if they are needed, and it will ensure that all past corrections have been made before the press is released. This is also an optimal time to check the color of the print job against any color swatches to ensure accuracy. Making sure that the color is 100% accurate is imperative when conducting a press inspection. This phase of the inspection will allow you to see imperfections in the coloring, otherwise known as “hickies”, ink in areas other than the image, and trails of ink in letterforms. It is important to measure the printing, either with a ruler or straightedge, to make sure that the printing is the correct size. You can then check to see if all of the pages are in the correct order, and they properly align. If it is absolutely necessary, check the binding, as well. It is important not to make changes unless absolutely necessary. Making changes to a press that is ready to be released is costly, and it is important to be mindful of that when conducting a press inspection. Remember that all printings will have flaws, and weigh the urgency of modifying the printing against the cost of fixing the print. 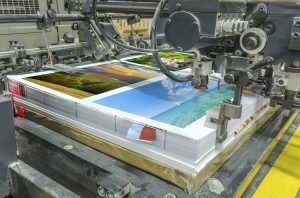 Press inspections are an essential piece of commercial printing. Ensuring their accuracy while being mindful of cost will ensure optimal commercial printing for your company. This entry was posted on Thursday, February 2nd, 2017	at 3:34 pm	and is filed under Equipment handling	. You can follow any responses to this entry through the RSS 2.0	feed. Both comments and pings are currently closed.